British authorities expect to spend weeks, even months, identifying the victims of the massive fire that engulfed a London high-rise this week, warning on Thursday that they may not be able to identify everyone. At least 17 people were killed in the disaster, although that figure is expected to rise. "There is a risk we may not be able to identify everybody," Commander Stuart Cundy said at a press briefing on Thursday. "The process will be very long. We're talking weeks, we're talking months," he added. Of the 17 victims that have so far been confirmed, six have been identified. Their bodies were recovered outside the building and police said it was for now "impossible to say how they died". 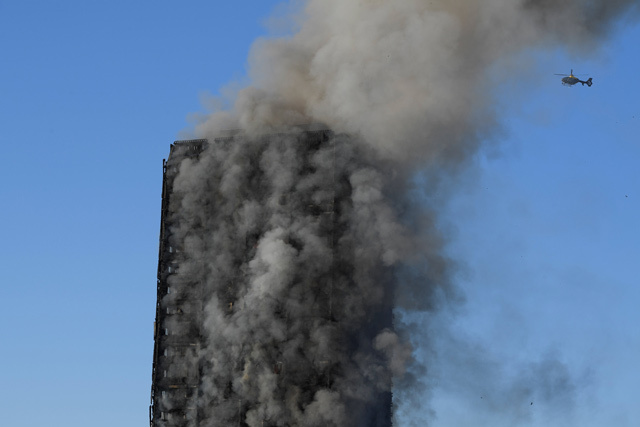 The bodies of the remaining 11 victims are still inside the smouldering tower. 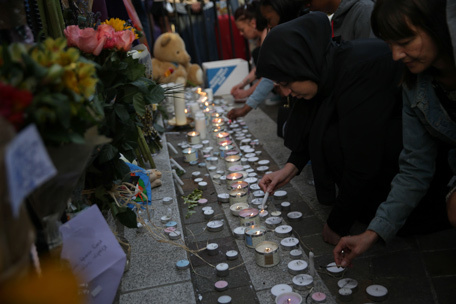 "They are simply not recognisable because of the fire," Fiona McCormack, one of the Metropolitan Police's senior identification managers, said. Police use one of three ways to identify the victims, McCormack explained: dental records, fingerprints and DNA. Using dental records "is the best one for very quick identification," as fingerprints and DNA are "much more difficult to get". If those methods fail, police look for secondary identification methods such as tattoos, scars or medical devices like pacemakers. But for now, authorities are still struggling to find out how many people were actually in the 24-storey building when the fire started in the early hours of Wednesday. 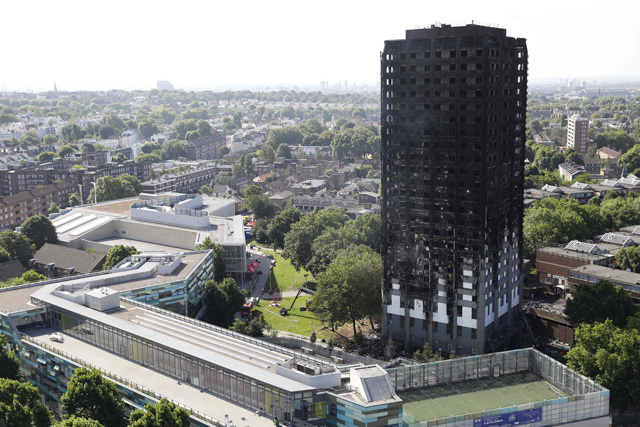 Six hundred people are believed to be residents of the Grenfell Tower. A "good half" of the building has yet to be searched according to Fire Commissioner Dany Cotton, who explained that additional shoring up was needed for firefighters to access the upper floors. But Cundy sought to downplay the number of missing people on Thursday saying that while 400 people had been reported missing, "it is an assumption". "A lot of people managed to get outside themselves and 65 were rescued," he said. "From a personal perspective, I like to hope it is not going to be triple figures". 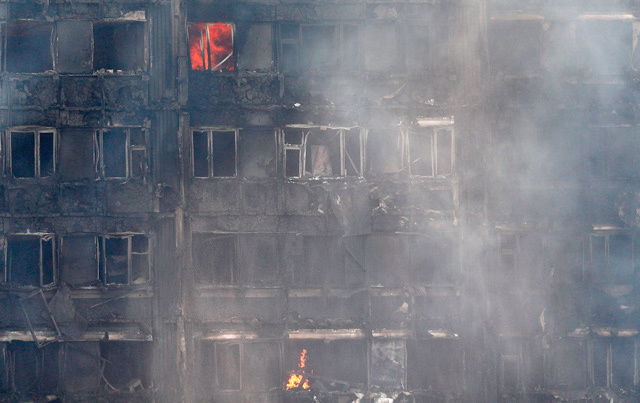 At least 17 people are confirmed dead in the massive fire that engulfed a London tower block on Wednesday, police said. 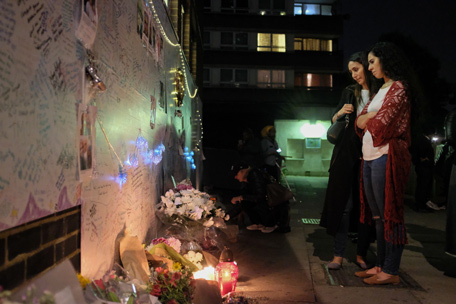 At least 12 people perished on Wednesday after a massive inferno tore through a London apartment block, with witnesses reporting terrified residents had leapt from the tower and dropped their children in a desperate bid for survival. As smoke continued to billow from the gutted building, survivors voiced anger over longstanding safety fears at the 24-storey Grenfell Tower, which was home to between 600 and 800 people. 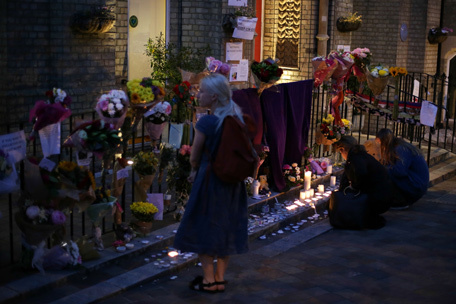 "There are now 12 people that have died that we know of," police commander Stuart Cundy told reporters at the scene. "I do anticipate that the number of fatalities will sadly increase" he said, adding that he did not expect fire crews hunting through the debris to find any survivors. The alarm was raised just before 1:00 am (0000 GMT) and within an hour flames had engulfed the entire block of 120 flats. The London Fire Brigade said the cause of the fire was under investigation, but its chief Dany Cotton said she had "never seen anything on this scale" in her 29-year career. 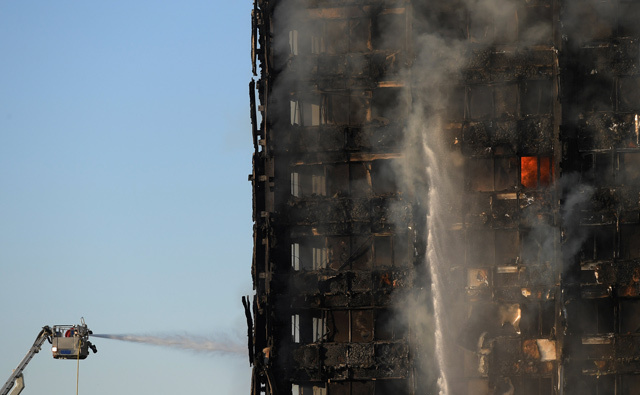 Six people were confirmed dead in a massive fire that engulfed a London tower block before dawn on Wednesday and the number is expected to rise, police said. 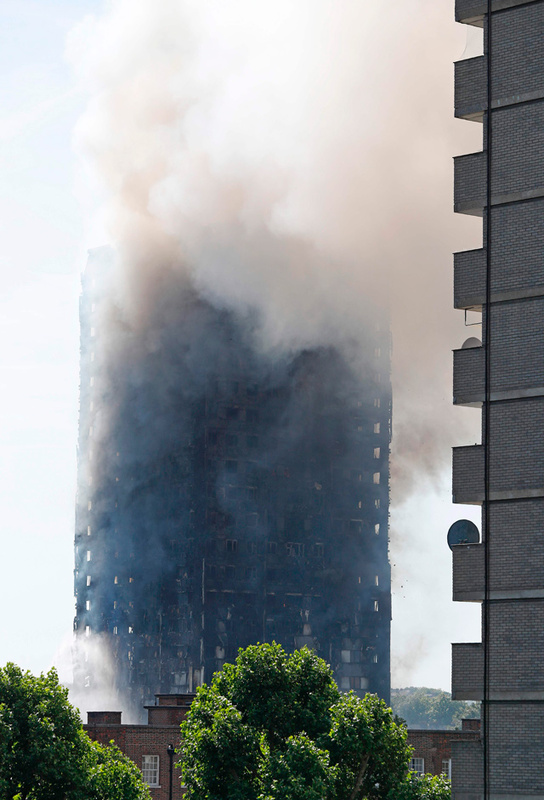 "A lot of people" are still unaccounted for after a massive blaze in a London tower block, and fire crews only managed to reach the 12th floor at the height of the fire, mayor Sadiq Khan said on Wednesday. "A lot of people are unaccounted for. 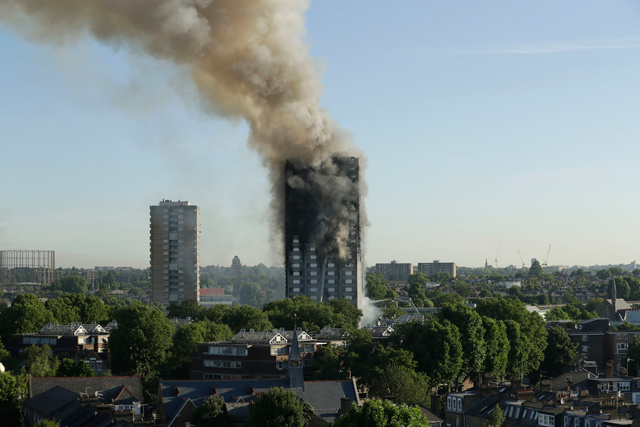 Some of them could have found safe refuges in the homes of their neighbours or their friends," Khan told Sky News television as smoke billowed from the charred 27-storey building. "A number" of people have been killed in a massive fire in a west London apartment block on Wednesday, London Fire Brigade chief Dany Cotton told reporters at the scene. "There have been a number of fatalities. I cannot confirm the number at this time due to the size and complexity of the building," Cotton said. 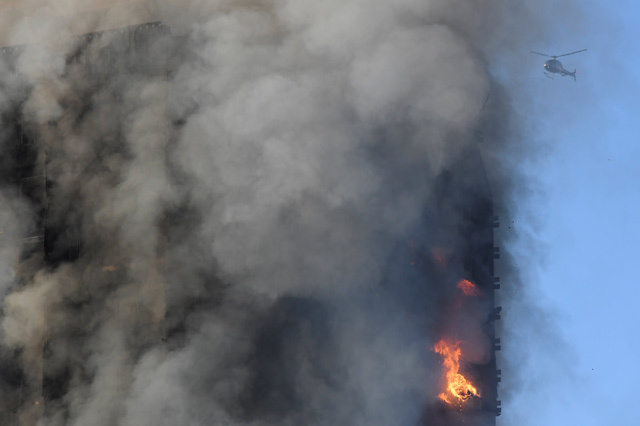 At least 30 people were injured in a fire that swept through a 27-storey London tower block early Wednesday, the emergency services said. Witnesses said they heard screaming from the upper floors as the flames rose in the night and one desperate resident could be seen waving a white cloth from a top floor window. Police said "a number of people are being treated for a range of injuries", including at least two for smoke inhalation. Four hours after the alarm was raised, flames could still be seen on several floors of the blackened residential building, which was shrouded in a cloud of thick black smoke. Large pieces of debris could be seen falling from Grenfell Tower, a 1970s block in the working-class north Kensington area - a short distance from chic Notting Hill. Police were also clearing out nearby buildings because of fears about falling debris and shut down a section of the A40 highway - a normally busy thoroughfare into London. London mayor Sadiq Khan also declared it a "major incident".